Home computer internet Tricks how to remove multiple friends at once on Facebook in just a few clicks! 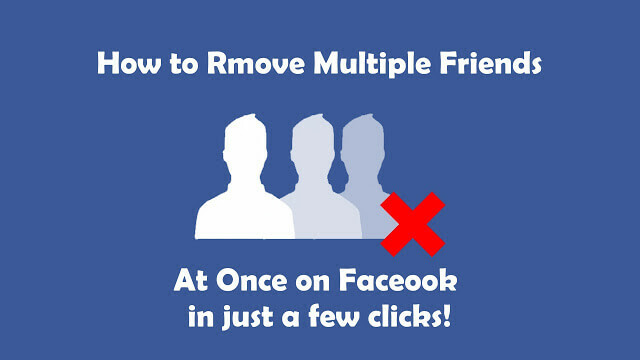 how to remove multiple friends at once on Facebook in just a few clicks! This tutorial explains how to remove multiple friends at once on Facebook in just a few clicks! The perfect time to do housework on your Facebook account ! Okay, there's definitely better to do but it's always a good thing to worry about the privacy of your Facebook account 🙂 Why not start this spring cleaning by removing many of your "friends" ? Let us make a brief observation: how many people have you added since all this time? And today, do you still want all those people you've added (and for the most part forgotten) to see everything you do on Facebook? Not sure ! But why do a tutorial on the quick deletion of multiple friends on Facebook ? Can not we do it ourselves? You can delete several friends on Facebook but it will ask you time, to say the least: p Those who have already tried to remove several friends from a blow on Facebook know what I'm talking about. You need to go to the Friends page, point your mouse cursor over your friend's name, wait for the pop-up of your profile, click on the "Friends" button and then click on the "Remove" link Friends list "at the bottom of the drop-down menu. Important: The extension is available only on the Google Chrome browser . You will need to download and install Google Chrome before proceeding. 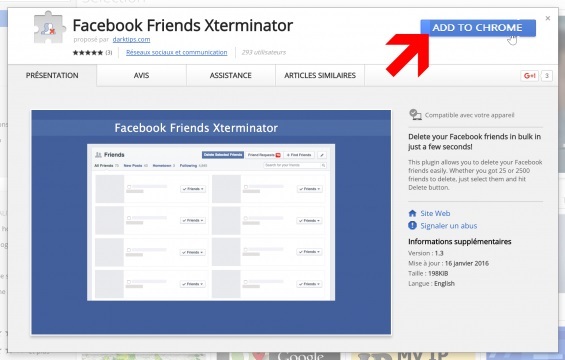 Go to the Facebook Friends Exterminator extension page and click the "Add to Chrome" . Confirm the installation of the extension by clicking the "Add extension" button. The Facebook Post Manager extension is downloaded and installed automatically in Google Chrome. Let's move on to the next step to remove multiple friends from both our Facebook account! Go to the Facebook home page and click on the Facebook Friends Exterminator button to the right of the Google Chrome search bar. Confirm by clicking "OK" to be redirected to the Friends page. Leave the Friends page fully loaded. With the Facebook Friends Exterminator extension, you should have a check mark in front of each friend and a "Delete Selected Friends" button. Check the boxes in front of the friends you wish to delete then click the "Delete Selected Friends" button. Attention, this action is irreversible! Facebook Friends Exterminator then deletes all the Facebook friends you've selected. Once the operation is complete, you should have a green inset at the bottom left of the page, summarizing the number of friends that have been deleted . On the capture below, a friend has been deleted (I had selected only one).